The 2017 updates to the John Deere T670 will make it a useful piece of equipment for canola and small grain producers. John Deere announced on June 1 that the 2017 line of its T670 model walker combines will include significant updates to increase productivity and reduce maintenance. Specifically, the John Deere T670 will have more threshing capacity and higher straw quality for baling. "The new model year T670 Combine has one of the largest active separation areas and largest cleaning shoe of any walker combine on the market today," said Terry DeMay, senior marketing representative for John Deere Harvester Works. "We've increased productivity by 15 percent in wheat and increased unloading rates by 50 percent. We've also made it easier to switch between small grains and canola, and improved the service points to allow producers to spend more time harvesting and less time waiting." The John Deere T670 will have a new swing-in Booster Bar to make it easier to switch between crops and adjust to changing conditions. It will also include a larger overshot beater, concaves, separator drum and grate, and walker area. "Compared to the previous model T670 Combine, this new model offers significant improvements that customers will quickly see and appreciate," DeMay continued. "When added up, these enhancements help producers harvest more acres per day and spend more time being productive." Similar to previous models, the John Deere T670 will have a spacious Premium Cab for operator comfort, as well as multiple transmission options. 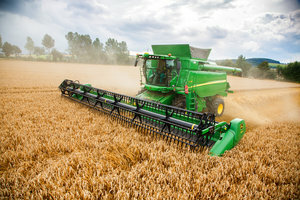 To learn more about the John Deere T670 Combine, speak to your local John Deere dealer or visit www.JohnDeere.com/ag.